In a programming language Data Types are a classification on the set of all possible data. This classification is based on the possible values of the types and the operations which can be performed on them. Most programming languages come with basic data types like integer, real, float or boolean. In programming languages like C, C++ or Java, there is a one-to-one correspondence between data types and a variable name. This is different in Python, where a variable name corresponds to the objects it references. This is explained in detail in the chapter "Data Types and Variables" of our Python tutorial. The data type object 'dtype' is an instance of numpy.dtype class. It can be created with numpy.dtype. So far, we have used in our examples of numpy arrays only fundamental numeric data types like 'int' and 'float'. These numpy arrays contained solely homogenous data types. dtype objects are construed by combinations of fundamental data types. With the aid of dtype we are capable to create "Structured Arrays", - also known as "Record Arrays". The structured arrays provide us with the ability to have different data types per column. It has similarity to the structure of excel or csv documents. 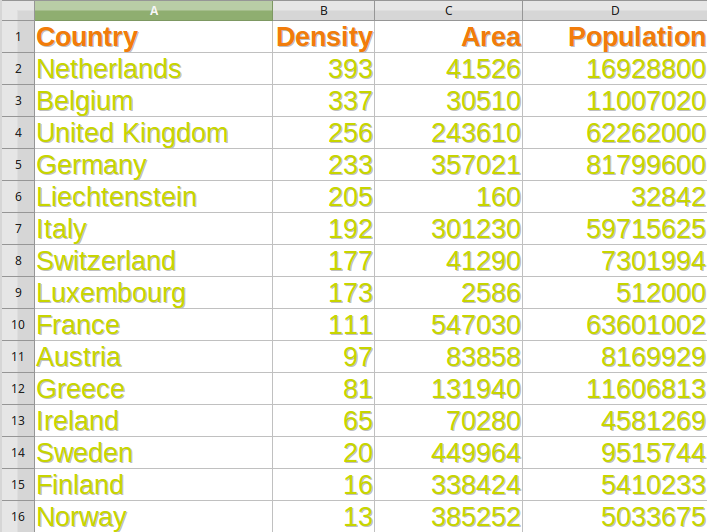 This makes it possibe to define data like the one in the following table with dtype: |Country| Population Density | Area | nbsp; Population | |------------|----------:|----:|----:| |Netherlands |	393 |	41526 |	16,928,800 | |Belgium |337 |	30510	|11,007,020| |United Kingdom |256 |	243610 |	62,262,000| |Germany |233 |	357021 |	81,799,600 | |Liechtenstein | 205 |	160 |32,842| |Italy |	192 |	301230 |	59,715,625| |Switzerland |	177 |	41290 |	7,301,994 | |Luxembourg |	173 |	2586 |	512,000| |France |	111 |	547030 |	63,601,002| |Austria |	97 |	83858 |	8,169,929| |Greece |	81 |	131940 |	11,606,813| |Ireland |	65 |	70280 |	4,581,269| |Sweden |	20 | 449964 |	9,515,744| |Finland |	16 |	338424 |	5,410,233| |Norway |	13 |	385252 |	5,033,675| Before we start with a complex data structure like the previous data, we want to introduce dtype in a very simple example. We define an int16 data type and call this type i16. (We have to admit, that this is not a nice name, but we use it only here!). The elements of the list 'lst' are turned into i16 types to create the two-dimensional array A. We introduced a new name for a basic data type in the previous example. This has nothing to do with the structured arrays, which we mentioned in the introduction of this chapter of our dtype tutorial. ndarrays are homogeneous data objects, i.e. all elements of an array have to be of the same data type. The data type dytpe on the other hand allows as to define separate data types for each column. Now we will take the first step towards implementing the table with European countries and the information on population, area and population density. We create a structured array with the 'density' column. The data type is defined as np.dtype([('density', np.int)]). We assign this data type to the variable 'dt' for the sake of convenience. We use this data type in the darray definition, in which we use the first three densities. The equal character '=' stands for 'native byte ordering', defined by the operating system. In our case this means 'little-endian', because we use a Linux computer. Another thing in our density array might be confusing. We defined the array with a list containing one-tuples. So you may ask yourself, if it is possible to use tuples and lists interchangeably? This is not possible. The tuples are used to define the records - in our case consisting solely of a density - and the list is the 'container' for the records or in other words 'the lists are cursed upon'. The tuples define the atomic elements of the structure and the lists the dimensions. It is highly probable that you will need to read in the previously written file at a later date. This can be achieved with the function genfromtxt. There is also a function "loadtxt", but it is more difficult to use, because it returns the strings as binary strings! To overcome this problem, we can use loadtxt with a converter function for the first column. Before you go on, you may take time to do some exercises to deepen the understanding of the previously learned stuff. Define a structured array with two columns. The first column contains the product ID, which can be defined as an int32. The second column shall contain the price for the product. How can you print out the column with the product IDs, the first row and the price for the third article of this structured array? Figure out a data type definition for time records with entries for hours, minutes and seconds. We will increase the complexity of our previous example by adding temperatures to the records. This exercise should be closer to real life examples. Usually, we have to create or get the data for our structured array from some data base or file. We will use the list, which we have created in our chapter on file I/O "File Management". The list has been saved with the aid of pickle.dump in the file cities_and_times.pkl.